This Saturday was the first time this year I made it up to Rocky Mountain National Park, high water flows from an exceptional high snowpack made a lot of the creeks unfishable until just recently. I headed out early and was at the trail head in Wild Basin before 8am (it takes me just under 2 hours to get to RMNP from my house); my plan was to fish the North St. Vrain. I checked the flows during the week and they have been coming down a lot since the peak but were still above the seasonal average. When I got out of the car I could hear the river - not a good sign. Before gearing-up, I headed down the trail to check the river and saw mostly just white water. I headed back to the car with mixed feelings but got ready anyway, I thought I would just head further up and see how things are. I got to the first water fall, the one where I caught a rainbow trout last time on my last cast heading back to the car, completing my Colorado Grand Slam. Well, that fine little bubble line of last year was a ripping current and I considered what to do. 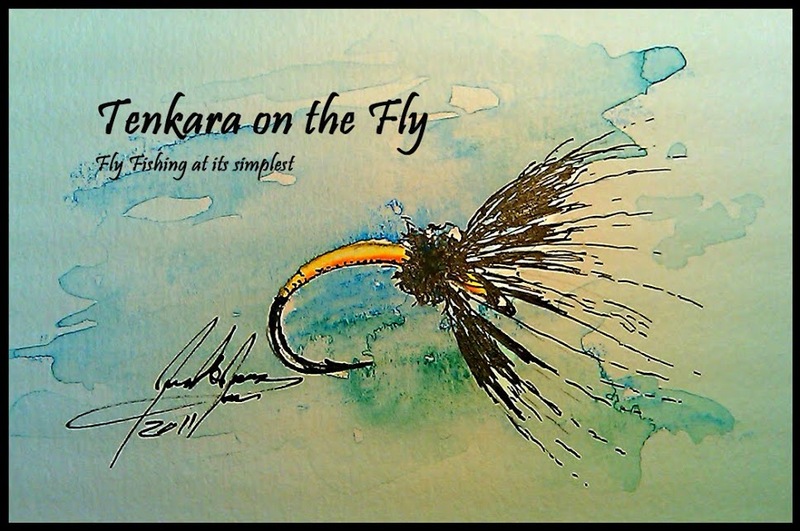 I tied on a swap fly, a little bead head pheasant tail sakasa kebari but realized its barb was not clamped down. I reached for my forceps but they were still back in the car. I debated tying on another fly and while going through my pack, I realized I left my fishing license as well as my driving license in the car. So I hiked back to the car, got what I forgot and headed back upstream. Due to the flows which were around 150cfs, I had look for water I could effectively fish with Tenkara: soft pockets, "flatter" stretches and log jams. I found them, but they were far and between which made for a lot of "hike and bush whacking time". Where I could, I tried to wade upstream just to find myself too often in a situation where I slipped and almost took a swim. The safer option was to break down the rod and fight my way through the brush. Once I found those pockets of water that were fishable, I was able to hook up with a good number of beautifully colored brookies and further upstream with my favorite native, the greenback cutthroat, mixed in with some hybrids. I fished all day with the same pattern, a size 16 CDC & Elk on an emerger hook (TMC2488). I hiked further in than last time because, fishing up the North St. Vrain, then up Cony Creek and then over to Ouzel Falls. I thought I would hike even further to get back to the North St. Vrain but it was already mid-afternoon so I decided to head back and maybe fish a few pockets on the way back. ... and I caught it again on the way out - in the same spot. I fished all day with the "300" of Tenkara-Fishing which performed well, although it was a bit soft for my personal preference. I think it has a 5:5 action, especially if compared to the Tenkara USA Iwana, my favorite rod. The length of 9'6" came in very hand in the brushy setting and it performed best with a level line the same length of the rod plus tippet. The furled camo leader that came with the "300" was in my opinion too heavy for this small rod and too camo - I had a hard time seeing the line which made tracking the fly in the heavy flows more difficult. Also, I was able to inaugurate the Ti Net of TrailLite Designs which performed beautifully. It took a lot of abuse during my wading, scrambling and bush whacking but you can't tell at all. I have to say, I never saw Colorado so green and "lush" (for Colorado standards) in August, thanks to the big snowpack and the daily thunderstorms we had this year. For Sunday, I had been researching and planning a trip all the way up the Poudre Canyon to hunt some arctic grayling. It was a 3 hour drive for Jason (who joined me for this trip) and me and we were on Joe Wright Creek just around 8am. We explored first the upper section, above Joe Wright Reservoir which was running at 10cfs. This is the section that was supposed to hold the arctic grayling. Well, we hiked and fished the entire stretch but could not spot one single fish - and believe me, at 10cfs you would be able spot fish if there were any. A little disappointed, we headed below the reservoir in hope of having more luck there (Chambers Lake also has grayling so we hoped they would be in that stretch as well). We fished several spots between Joe Wright Reservoir and Chambers Lake, then headed below Chambers Lake and fished there in hopes to catch ANY fish but unfortunately, the fishing gods were not with us. The further downstream we headed the heavier the flows and steeper the terrain became which made for some very difficult Tenkara fishing. It was a beautiful day but there were no grayling or any other fish for that matter. You can plan and research as much as you can, but sometimes it's just not in the cards. You can't take catching fish for granted, and this will keep you humble. Overall, this was a great weekend though. Yes, the fishing on Sunday could have been better and I could have slept more but being outdoors and spending time in the mountains is what Colorado is all about. I love this place.